When it comes to heavy duty jobs on industrial sites, Waters Vacuum Truck Service has the experience, equipment and customer management to handle large-scale industrial services. For more than 50 years we have provided top-tier service with the utmost professionalism in Nevada and Eastern California. Hydro Cleaning is the process of removing all liquefied materials through a high powered vacuum. Our service trucks are capable of maintaining hundreds of gallons of water for cleaning and removal from an industrial project. If materials to be removed are solids, water is injected into the materials to be removed. Hydro Excavating is the science of digging with water while vacuuming the slurry into a debris collection tank for a clean, precise excavation. Hydro-excavation is the future for safe excavation and Waters Vacuum Truck Service has studied the science extensively to master the best practices. We changed to Hydro Excavating prior to our competition, putting us ahead of the curve. Flow control is the art of minimizing or redirecting non-hazardous liquid material while construction activities take place. We help construction crews work safely and quickly through jobs that require this process. Our vacuum trucks can quickly remove huge amounts of non-hazardous material. We are also able to sanitize the area where the material is spilled. 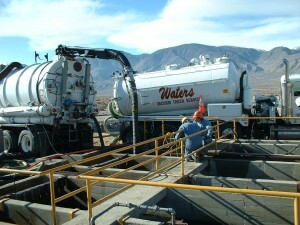 Waters Vacuum Truck Service is a state-certified, authorized agent for collection and disposal in Nevada and California. We pride ourselves on delivering timely results for all our collection and disposal customers.